There’s a Thai nonsense rhyme that makes memorizing the mid class consonants easy! I learned it a long time ago, and a good Thai buddy of mine recently reminded me of it. It goes like this…. This roughly translates to… “The chicken pecks the kid to death, the kid dies on the rim of the basin.” or “The chicken pecked the kid to death, the kid to death, at the rim of basin.” Whichever way paints a clearer picture in your head. ไก่ จิก เฎ็ก ฎาย เด็ก ตาย บน ปาก อ่าง <– We’ve just used all of the mid-class consonants in the same verse. While we’re talking about consonants… Here’s an easy way to spot and memorize the 11 high-class consonants as well. Maybe you have noticed already but the high-class consonants all are pronounced with a rising tone. Take a look! ข ฃ ฉ ฐ ถ ผ ฝ ศ ษ ส ห Each of these characters is pronounced with a rising tone while all of the other consonants are pronounced with a mid tone. (For example พ = paw, mid tone and ผ = paw, rising tone.) It’s a dead give away! 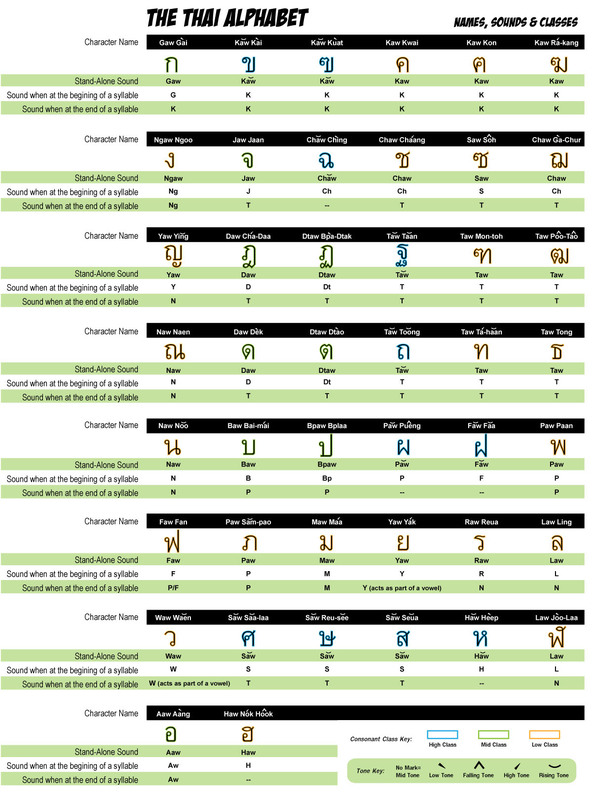 It’s like the creators of Thai language knew we’d need a tip-off as to which constants belong to what class so they hid an easy memorization trick in plain sight… or, in this case, sound.